Howdy again! It’s CJ! I’m just writing a brief intro to introduce today’s blogger, Joy! I've been learning so much from all of the comments, and I hope to get to reply to some of them soon. I hope I haven’t disappointed thus far. I do think the context post has sparked a really nice conversation. We’re just trying to cover a really wide variety of options available to students. Joy has lived on campus for several years, whereas I only lived on it my first year, so she offers some nice insight to how our dining plans work. Also, just so you know a bit more about us, I’m working on a second master’s degree in Communication Studies and Arts/Non-profit Administration. I also have a Master of Fine Arts degree in Theatre Arts from Texas Tech. Joy is also studying Communication Studies and has a bachelor’s degree and will soon have a master’s degree from Tech. We both love “Raiderland”!!! I know there are fellow “Red Raiders” all over the world, so I did want to offer a nod to the writer from Nairobi, a fellow Tech grad! Now, without further ado, here’s Joy! I feel that having been a student at Texas Tech University for six years and having lived on campus for at least four of those years that further explanation must be given for pricing and content of food choices available. Each residence hall or dormitory has a dining hall that accompanies it. Some of the food choices are cafeteria style, some are more along the lines of fast food, and still others are available so that an individual may tailor his/her food choices to suit dietary needs (or satisfy a picky eater). The contents of some food choices on campus that are usually ready to eat are also usually very high in salt, sugar, and fat which may be a partial attribution to the “freshman fifteen” (or more). There are lots of food choices, both good and bad available, but when students enter college some of them do not always make the best choices and it can be difficult to navigate all of the available options to make the best choice. There are informational sheets available that explain many eating options and ways to make better choices which may be helpful to the students if used properly. Additionally, a vast majority of the food is priced for students who purchase dining plans with their housing so that it is all inclusive. The monetary value of the dining plan is stored on the student’s identification card much like a credit card. The students who live in the dining hall usually do not pay attention to how much the food costs since it is “paid for anyway” they just get what they want, swipe their card, and leave. For those who purchase food and do not have student dining plans the food costs even more because the student discount is not applied and the food is usually increased in price out of convenience and other costs that go into preparing it. Today I really wanted to go to my favorite custom salad place and order the 4-day salad. I call it that because the amount of salad that I receive usually is enough to last me for one meal (lunch or dinner) for four days. The salad is custom made and usually is purchased by the pound, but due to a summer camp, the salad place is temporarily closed and an “All you can eat” food center is now in its place. So I walked over to another one of my favorite places and ordered a custom made Wok instead. The Wok portion of the meal is a custom made dish that is prepared from ingredients that are selected by the patron and then cooked in front of you to ensure quality and freshness of the meal. A patron can choose to either have their food cooked in oil or steamed in water. I chose to have my order steamed so I ordered my favorite Wok which consists of: steamed rice, water chestnuts, broccoli heads, chicken breast, red onion, chopped celery, sliced mushroom, and a little bit of soy sauce for seasoning. I also received a complimentary fortune cookie with my order. I purchased a bottle of green tea and a bottle of water in addition to an apple. The chopsticks are used to monitor the amount of food eaten in a bite. This creates an awareness of food instead of just shoveling it in with a fork or spoon. Mouthfuls: I forgot to count (Sorry, I’m not used to counting mouthfuls.) I can tell you that there was enough food there to last for both lunch and dinner so it was almost like getting two meals for the price of one. CJ, here to sign off! This looked really yummy to me. I see there is even a fortune cookie. I think that’s an American thing. Y’all have a great day! It's late in the UK and when I say VEG is asleep in the tent what I mean is she's reading by torchlight and thinks I don't know! I just wanted to say how wonderful it is that Dave Brown commented on your post with the news that he and his employer have got together and donated £200 to Mary's Meals. That takes the NeverSeconds JustGiving page past £112,000, thanks Dave! At £10.70 to provide a Mary's Meal for a year to a child it means Dave's generosity along with his employers will offer a school lunch to 18 children for a whole year. That's incredible. Thanks Dave for the donation and thanks CJ and Joy for blogging. Let's not forget how little it takes to make a difference, £10.70 a year. The cost of Joy's meal today would have meant a school dinner for a child for 7 months. Welcome Joy! Knowing you can treat that as two meals' worth makes the price look a bit more realistic (not to mention the portion size - do some of your fellow students really eat all that?!). I think the food-o-meter rating is basically how much you enjoyed the food. A health rating (which escaped on this one!) is a rating for the overall nutritional balance of the meal - this one looks pretty good to me. Thanks for the insight into how dining on campus works, too. Hope VEG is enjoying her book by torchlight! Sadly, we do have a problem with portion size here in America. Some students really would eat that whole salad in one sitting! Some people think that if a whole plate or container is not full, they are not getting enough food for the price. This blog has really opened my eyes to the food in other countries and also to how much we really overeat in America. £112,000.00 wow, that is great!, congratulations everybody involved in donating and getting tht total this high. 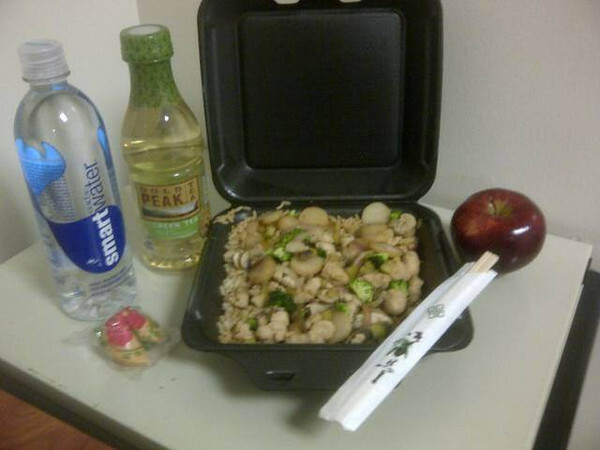 Great blog, Thank you CJ and Joy, that wok meal looks good (except the chicken for us Veggies). All the best with your studies, and wishing you good results. Also thank you for explaining further the dorm dining system. Pretending to be asleep, no doubt hiding in the sleeping bag hoping the torchlight won't be spotted. My children did that and perhaps I did all those years ago, ingenuity, gotta love them for it though. I've been looking at your website, and I adore it. I make websites myself, and I wondered if you'd like it redesigning? Veg's dad- I love the comment about Veg reading by torchlight and thinking you don't know- makes me wonder if my mum knew I was doing that when I was Veg's age! Thanks! I really wasn't sure. I had read a long time ago that they were invented in the States, so I wasn't sure about distribution. That wok meal looks delicious and just the sort of thing I'd order. It's generally four years for an undergrad degree, another 2-3 for a master's (some are terminal, so an MFA is generally 3 years compared to an MA, which generally takes 2.) Then another 2-4 for a PhD. I think the average for that is really more like 3-5, depending on course rotations and how long it takes a person to write a dissertation. Joy, I am still shocked at the prices you pay for food. But you could save a lot of money and save the environment at the same time by buying a Brita water pitcher and a portable container (stainless steel) for your water! College education in the US lasts 4 years for undergrad. Add on as you go for advanced degrees. I had a meal plan in college, too, which got me into our dining hall, our diner, and the convenience store. During my freshman year, I subsisted on chicken caesar salad wraps, Easy Mac, and pop tarts. I think it's great that the students are offered information about making better food choices but I can't help thinking it wouldn't be needed if the bad food wasn't made as easily available as the good. Joy, if you ever come to the UK, make sure you don't drink what we call Smartwater!! Wait, what's Smartwater in the UK? I'm from the US and when I was in school in London I never saw anything with a Smartwater label on it. That salad looks so yummy! I'd love to have it as a lunch option, I love everything on it! I just can't imagine eating rice with chopsticks. I know japanese and chinese people do that all the time, but I don't think I could have such fine-motor coordination! And congratulaions on the money raising, VEG and VEG's dad!! That's awesome news! Welcome on board the good ship NeverSeconds Joy. Thank you for your detailed account of the food in your cafeteria. The Smart Water made me smile (or was it a frown?). I've been reading this blog for some time now, and i love it! I think is not only showing how kids around the world eat, but also some of their culture and customs.